Player's condition. 100% working. Average cabinet with touchups, playfield cracked or flaked off in several places over inserts, left ramp cracked in multiple places, new full set of plastics, LEDs except for flashers, boards and connectors show signs of wear or repair. Routed by owner at one location--Chronic Town/Music Underground in State College, PA, 16801--for less than 1 year, then in storage for a year. I am handling the sale for the owner, so call or PM me if interested. Price is firm, cash only, pickup only, no delivery, and no trades. Seller is motivated but also firm about these terms. These are JOESCHALL's all time market stats. You are going to make some ones year!! Great price for a solid game. If local I would be running to see physical shape in person. Thanks so much for the support. It is a shame the playfield isn't in better shape, but this game plays well and is priced to sell. Is it have a complete playfield overlay or just insert decal overlays? I think the original clear on the inserts has flaked/worn away and that is what the op is referring to. i could be wrong. i've never seen or heard of a playfield overlay being made for this game. In fact i've never seen a GNR with any amount of extensive wear. Most GNR's I get in to be restored have a little wear from axl kickout and some edging around the GNR inserts. In fact i've never seen a GNR with any amount of extensive wear. look at the second video. Can't beat that price. I am seriously thinking about this one. Very nice that videos were taken. That is first class in my book!!! they wern't coming up on this computer. Looks like we might get our first snow storm in State College this year on Friday-Saturday. It's a good question. Based on the nature of the cracking (which seems to extend beyond the inserts) and feel of the playfield, I'd say this is a complete overlay, but I'm afraid I've never dealt with an overlay before. If the game lasts a while and I have time, I'll find out more if I can and post the results. Joe is a great guy to deal with an you wont find a nicer guy in the hobby. Very tempting, just so far! Quoted from hAbO:Joe is a great guy to deal with an you wont find a nicer guy in the hobby. Thanks hAbO! You're one of the great people I've met through this hobby, and whose collection and dedication I really admire. I have a phone call to answer about the GnR from a pinsider today. If that doesn't turn into a quick sale I will plan to get a more detailed video walkthrough of the playfield and better identify all flawed areas of the playfield. I am curious myself about the overlay issue--the machine's owner (who I am repping) called it an overlay, but I don't find any overlays for this title through an online search, so I'm thinking it may be the original clear that is cracked and peeled away after reading some of the posts above. In any case, the bottom line is that the game plays well but the playfield has numerous, obvious flaws that were there when the owner purchased the machine. No idea how the flaws occurred. And be assured that any potential buyer is welcome to inspect and play the machine all you want. There are some great routed pins to play in the shop as well: SS, BSD, LOTR, POTC, TWD, and WOZ. I'm thinking it may be the original clear that is cracked and peeled away after reading some of the posts above. This. It looks like the clear and the inserts decided to end their relationship. Prospective buyers should keep in mind that CPR has art for GNR playfields ready to go - hopefully those will see the light of day in the not too distant future. And Dave is apparently intent on re-running G ramp repros when he has the time. Very helpful, Blackjacker. Thanks for the clarification. I love the CPR playfields, and I've looked but have found no replacement ramps. If the new pfs and ramps are produced, then this GnR is a great candidate for a full restoration. It looks like the clear and the inserts decided to end their relationship. Well said, and thank you. I have revised the ad language accordingly to remove the reference to the overlay and reworded thus: "playfield cracked or flaked off in several places over inserts." However, the center logo is an overlay and were made (Mine has one) If you look close in the video you can see it. Tempted to pick this up even though I have one! GLWTS! Thanks to all for the helpful comments above, the pinsider good will, and the phone chat with a pinsider about the playfield condition and trying to sort out why--as is noted above--"the clear and inserts decided to end their relationship." I'm still not sure why that happened (did someone perhaps clear this on their own overtop of what was already there, and that new clear is coming off? ), but once again the bottom line is that the pf is cracked and chipping overtop various inserts. I did another more detailed video walkthrough below to represent each area of the playfield. Looking at the video, in addition to those inserts I mention in the video, I see there are also cracks over the "Add Member" and "Duff" inserts. So this is a player's condition damaged playfield, a restoration candidate for someone with great skills, or a restoration candidate for someone who can swap in the CPR playfield if it is indeed made in the future as suggested above. I'll stress again the seller's terms--cash and pickup only, no trades, and price is firm. He has already had lower offers for this pin and others as well as package offers, but he is sticking to his price of $3,600. No offense meant if other offers are politely declined--I just don't want to waste anyone's time. It could have been operator stored for years in a cold climate to do what it has, or it has been played a lot. Sometimes playfields just do bad things. I don't think there is any shame in that playfield for several reason. It's a player and it's playing! Any potential buyer will have a blast playing this game as is. They can play the crap out of it and not feel guilty, just wait for the CPR fields. $3600 is very fair imo. Back in the day, 5-6-7 years ago, GNR used to hover around $2-2500 all day long. Heck, I sold a collector quality GNR in 2009 for $2500! but, time has proven that it's a hard to find game, the theme is awesome, it has a very solid Lyman ruleset/code, pinsound boards make this game come alive, if I had an extra $3600 I wouldn't hesitate to buy this as a spare. Again. many thanks for the unsolicited and good will comments and explanations. With all the clutter on pinside, it's nice to see people saying positive things about a FS item. Well, that reflects more on you than anything. The item is a good price and you have gone well beyond what anyone else in terms of documenting condition. I'd buy it, but PA is a bit too far and you aren't shipping. I just saw this pin in person while I was playing at Chronic Town. I am not a fan of the theme or I would buy it. The pin looks very nice to my eye. It is not perfect, but it is priced accordingly. Put this pin into a line-up and the flaws that Joe is pointing out in detail would go unnoticed by most players. If you want a G&R that you can play and enjoy from day one this is the pin for you, it is clean and plays well. This is not a beat to death routed pin. It has wear from use, not abuse. When a machine is fairly priced and worthy of such price, there should never be any negativety. Very fair price and a great video for potential buyers to look at, not many around so detailed like yours. I would already have this in my game room if we were not so damn far from one another. Deposit received from a buyer to hold the pin, with pickup scheduled for next week, so this ad is now marked Sale Pending. I will update this thread with any status changes as needed. Thanks very much to all those who phoned or PMed me. This ad drew a lot of earnest interest, and I appreciate it. Seller update: Pickup rescheduled to this week. Buyer had to postpone last week's pickup because of the blizzard. Pickup still hasn't happened. I have given the buyer until Monday, Feb 15th, to pick up the machine, and if it doesn't happen by then, I'll turn to the next person in line. I will update this thread with any status changes, and thanks to those who have inquired. Wow. Very accommodating on your part, especially given the fair price on an in-demand title. Hopefully you're not being fed a line of BS by the seller, and he realizes he's getting some pretty generous terms. Best of luck with the sale! Wow. Very accommodating on your part, especially given the fair price on an in-demand title. Thanks, Blackjacker. I can see you're a fan of the game. Rock on! Seller update: The deal with the original buyer fell through, so I refunded his deposit and removed "Sale Pending" from the ad. The game remains for sale with no one in line, so the first person to pick up the game for the asking price gets it. 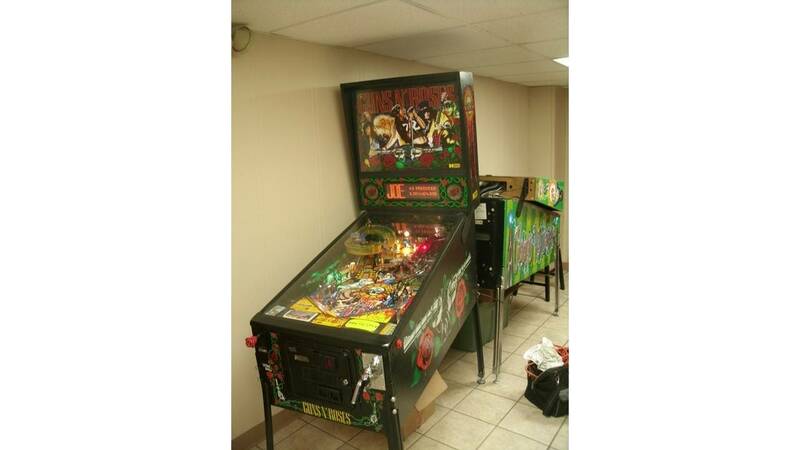 The seller is firm on price, which I can understand given that it is 100% working and the current Mr Pinball List and Price Guide and the last year of eBay sales ( according to bostonpinball.biz) list the game's value at over $5,000. This ad will expire on March 1st, so if the game doesn't sell by then we will likely put it back in storage. Feel free to call or PM me to discuss further details, but know that the price is firm, cash, and pickup only. Seller update: I believe we have a sale outside of pinside and for the asking price. Pickup is scheduled for March 5. This ad will expire on March 1, so if anyone is interested in being in line in case the sale falls through then PM me. Thanks to all who inquired and especially to those who kindly educated me on the GnR playfield issues.